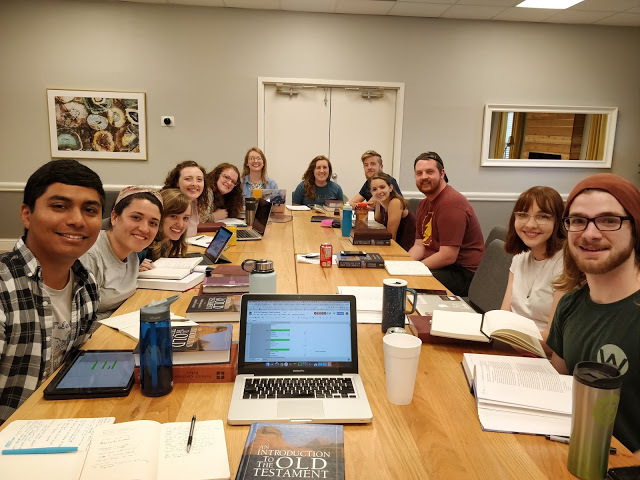 Those two weeks were incredibly exhausting, yet I enjoyed getting to explore and understand the scriptures in a way that I had never before. I got to see the story of God's relationship with humanity and what he intends for us. It's pretty cool to see that regardless of how people behave and go against him, God remains faithful to his people and wants what's best for them. 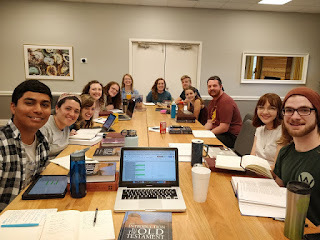 We got to have a prep day before classes started with our corefas (student leaders who lead our small groups called "cores"). This day was so beneficial to preparing for the year and students that would be on our campuses. In the process I also got to better know our student leaders and grow closer to them. A photo of our leader team taken during our lunch break! The first week of classes at the Collin College campuses primarily consisted of the staff and some student volunteers meeting new students by playing games such as spikeball and football bowling, as well as asking people questions about their week. As a community we really value genuine friendships and want to offer that to people we meet, especially seeing as the college campus can be such a lonely place for many students. A Snapchat video from our set up at the Spring Creek campus! Our welcome week events were such a great opportunity for people to make friends and check out our ministry. Whether they stick around or not, I hope that they realize that there are people willing to be their friends on their campus! Discussion groups during our first Thursday Night Focus (TNF) fellowship meeting. The first month was challenging. Meeting new people can be out of my comfort zone, and I don't like sweating or playing sports. However, at events like TNF I'm reminded of the value of working for these students. They're invited into community where we challenge them and point them to Christ-centered relationships that can be so fruitful. This is so important in this day and age when the college campus can be so relationally and spiritually challenging. I'm ready and excited for month two! Thank you so much for taking the time to read this and invest in this apprenticeship and God's work through your finances and relationships. These updates only provide a miniscule insight into the way your support is already impacting students on campus! Please pray that students be introduced into loving and genuine friendships, whether it's through our community or other people. That our students leaders and staff will continue to be bold and do God's work- whether it's something as simple as meeting a new student or helping someone move into a new apartment! For those of you who didn't know- I just got engaged to Jacy (my girlfriend of almost two years) this past Sunday! Pray for continued guidance for the two of us and that we continue to have a healthy and fruitful relationship as we prepare for marriage! 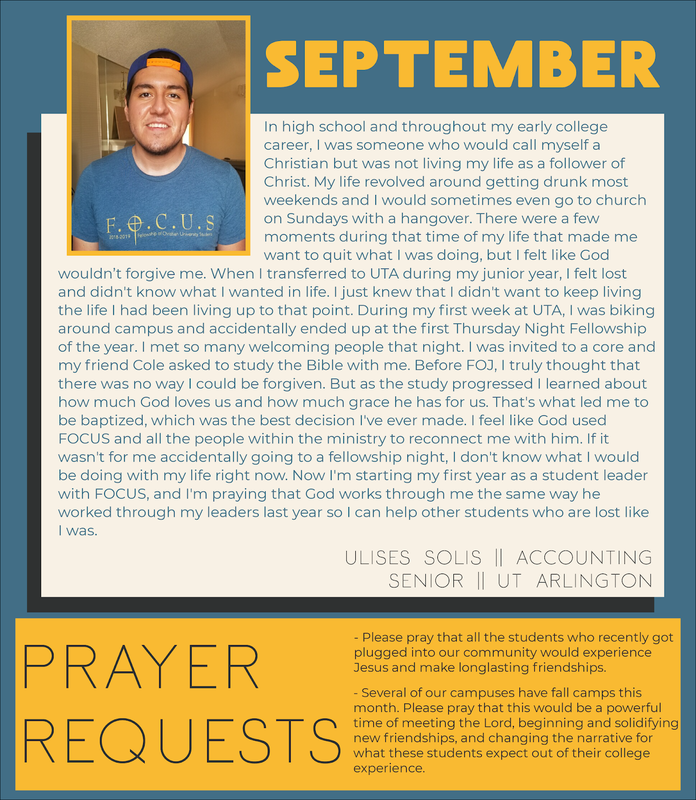 Below you can find our student testimony for the month of September. Thank you again for your time and support! Hey Alex, I don't like to sweat or play sports either! We have so much in common. But I am encouraged that you chose to do those things anyway during your welcome week. 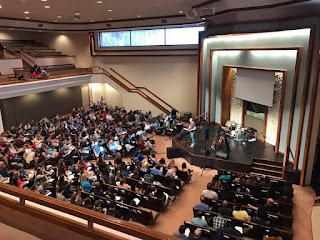 Those first few weeks on campus are such a crucial time to get to know people, and it's a huge opportunity for us as disciples to start relationships that will point people to Jesus. Thanks for your hard work out there!